“Treasure” the neatly penned label read. I scanned the pile of boxes stacked against my desk. Something made me label this one box, besides the occasional urge to organize my life. When I sit at my desk, I can reach all the things I love; pictures of husband, kids, grandkids, changing with the calendar – and faces of those that are gone now, framed memories. My dad smiles, tan and shirtless from a beach, my brother Timmy and I arm in arm in front of a green canvas tent at a campground, and Spence to my right, his little Cambodian sister Jade smiling from atop is shoulders, his face focused, not smiling but not sad, the gaze deep and searching. A corkboard above is covered in sheathes of photos, scriptures I must never forget, a note scrawled by my granddaughter, “Hello I hope you are not feling lonely – hope you r filt wif joy”, and some of Spencer’s prayers he wrote to God alone. I smiled and pulled the Treasure box out from under the pile. Whatever it was, was important, I mused. As I lifted the lid, I saw letters and cards, and as I thumbed through each one, I remembered those who dared to love me, reaching deep into my pain 14 years ago this month. I had culled the best of the best and named them appropriately; Treasure. The cast of players was peculiar. There were letters from my sons, including Spencer, from my husband, encouraging me to live again, from the assistant DA, and a copy of a letter from Samuel Rutherford, a brazen Scottish preacher from the 1600’s who reached into my heart with his council to a young mother who had lost her daughter. Lining the bottom were Kina’s letters to my mother, written 50 years ago after my brother Timmy’s death. There was also a letter from Elisabeth Elliot, who went home this past year. She very promptly returned my correspondence twice when I wrote her after Spence died. I told her she was my spiritual mom and she thanked me for that. Then a letter from another spiritual mom, Marian, a woman who touched my life when I was in my 20’s and left a lasting imprint. Marian was married to my grandfather’s first cousin and neighbor, J.G.. My grandfather left home for good as a young man and became a doctor. J.G. was also educated, but decided he loved raising cattle, children and pecan trees along the airy marshland of Edisto Island. Marian was a teacher from the mountains, inquisitive, a traveler and the hardest worker I ever met. She loved J.G. with an amused sideways glance, and they were both the first real Christians I ever met. They took me into their lives and loved me, a free-range poet from New York City who landed on their porch in a jet stream of cocaine and Jack Daniels. There, side by side with this couple in the ebb and flow of farm life and the raw wild of this coastal island, I learned that God was among us, in the field, in the storm, in the broken down trucks. Marian showed me patience with humor, grace with humility. She held up a mirror and showed me Christ’s reflection before I could even put a word to it. I pulled the yellow folded papers from the box, the familiar scrawl, hands that must’ve been 80 and arthritic; hands that worked and loved the energy of life and dirt and things that could grow. She had loved Spencer too. “A note from Marian Murray “ was at the top of the stationary with a birdhouse on it. Courage is the basic virtue on which all others depend for vitality and life. As I reread the words, I retraced the surprise I felt nearly 14 years ago. 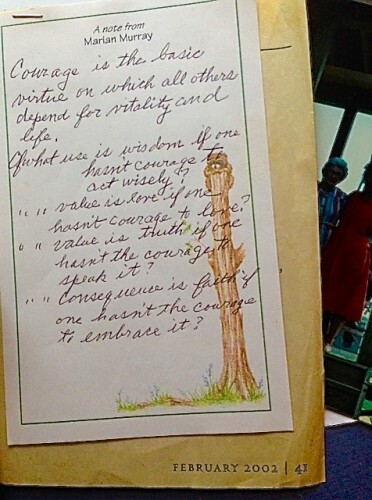 Amid a flood of flowery Hallmark sympathy notes, the word Courage had leapt out at me, and I wasn’t sure I liked it. Courage? But it was Marian so I had held the message tighter. Of what use is wisdom if one hasn’t the courage to act wisely? Of what value is love is one hasn’t the courage to love? Of what value is truth if one hasn’t the courage to speak it? Of what consequence is faith if one hasn’t the courage to embrace it? There was no signature, no wrap up, no “praying for you” or “May the Lord etc. etc.”. Then on a page stapled to this were three scriptures. Rereading this unusual sympathy note now, I realized how deeply these words had directed my path. She was taking me by the shoulders, and in an amazing act of love and rescue, shaking me and pointing upward. She was correcting my posture. Marian came to visit me in June 2002, 5 months after Spence died. Her knees were bad but she would only let me help her down the stairs. She had never been to Cape Cod; maybe even Massachusetts. We drove along the Old Kings Highway, comfortable with silence, distracted by the rambling roses and lilacs. I was still stunned and exhausted with the daily work of grief. She was in her eighties, her presence there was all that had to be said. I drove her to Logan airport at sunrise. I don’t remember if we ever said “I love you” but watching her disappear into the airport, small and frail, I knew she had to love me a lot. Less than a year later she died peacefully, pneumonia finally overtaking the “lousy lungs” she endured since childhood. “ I don’t know if I’m more of a grandmother, or mother or just friend to you,” she remarked once while we picked tomatoes in the full Carolina sun, sweat dripping off my face onto my dusty hands. “Maybe all of them,” I suggested, and we laughed, an easy laugh that Marian taught me. A laugh that is not afraid. I gently laid the note on top of the rest of the letters and cards and shut the lid. January is a month of shadows, of hovering at the edge of sorrow in my life. Orion appears in the sky, sword drawn, signaling a time of year that is tough for me; an anniversary, a birthday. But I know God wants more than just a posture of grim determination. He wants to see me reach up past Orion, and touch His throne. He wants to hear me sing. And of what use is life without the courage to really live it? Be of good courage – for the Lord, your God is with you, bringing treasure. Edisto Island – lots of treasure! I told my husband I would not complain anymore. I didn’t mean forever. I might’ve meant that day or evening. No, I think I said too much about it – about gratitude and rejoicing and how I needed to regain some things. Darn. Now I’m stuck. Ooops, I just complained. Now I get it why old people become grumpy and stuck in their ways. Your body hurts just getting up. You need naps. Predictable is attractive because the variables in life can be overwhelming and frankly you get tired. What if I get cold? Sick? Lose money? Get a flat tire? Miss a flight? We find out life isn’t fair, that stuff happens no matter how carefully you plan. Dreams are detoured, hope short-circuits. So we complain. And it’s okay for about five minutes. But if you’re still whining five weeks later it’s a big red flag. You should either move to Long Island or call a Whaaaaaa- mbulance. Before I flew to Korea in 2009 to visit my son, his wife and my granddaughter who was turning one, I put my self through a mini- boot camp. I had just come through the other side of surgery, chemo and radiation treatment and I felt pretty wiped out. So I walked, I swam and I practiced doing without some things I thought I could not do without – like two pillows; one puffy, one floppy. I even switched sides of the bed and practiced drinking my coffee black. Yikes. It proved delightful. When we traveled up and down the country of Korea, sleeping on floors at times with no pillows, I felt free. And okay maybe a little sore in the morning, but not bad. When you look at those wrinkled wiry old Korean woman, napping on a 2 x 10 after squatting in the hot sun for 8 hours drying peppers so they can work 8 more before going home, it humbles you. You dare not even wince. It made my boot-camp look like a spa. Sometimes steadfastness looks so…boring. But the longer I serve God the more I am convinced that this is where He stands and takes notice. Not at the big events, the sell-out revivals and concerts and crusades, but when we are all alone and no one would blame us if we walked off the field and quit and left this God-forsaken land. Yet nothing grows and matures by uprooting and going somewhere where no one knows you. That’s like adding a third pillow. Behind the gold medal is endless tedious hours of shooting a ball or walking a balance beam. But how do we maintain our steadfastness without falling into a spiritual rut? How do we face the furnace without running let alone complaining? Many years ago, I spent a summer out on Edisto Island. Then, my grandfather’s cousin, J.G. was still alive, and ran a 400-acre cattle ranch. I offered to work for my keep and J.G., then a young 66-year-old rancher who worked from the pre-dawn silence to beat the stifling South Carolina heat, until the cicadas sang past the sunset, was my boss. He taught me how to cast a shrimp net, how to bale hay and how to use a seed caster. I remember driving out into the middle of a huge newly plowed field in the middle of his property and being handed a seed-caster, a canvas bag that you slung over your shoulder filled with grain seed that sprayed out of the side as you cranked a handle. Simple. “Okay, let’s go!” he said and began walking in the brown dirt towards a horizon I could not even see. When we reached the end, we turned around and walked the other way, all day, stopping to fill the bags occasionally. At first I wanted to cry, looking north, south, east and west and seeing nothing but a big brown desert. My twenty-year-old legs had a hard time keeping pace with this man, in the overbearing midday sun, but I noticed that he looked down as he walked, his neck brown and worn as an old saddle. He stopped every now and then, spying something in the caked overturned dirt, and bent down to retrieve a treasure– an old piece of pottery, or glass or an arrowhead; pieces of history from a land that had been settled by Indians, Spaniards and a family that had all died together, most likely from a plague, their overgrown grave markers still visible in a grove of trees in the middle of the field. He’d call me over and we’d stand there marveling at a clay shard, imagining a past rich with human history. After lunch, I actually wanted to go back out to the big field. I said I wouldn’t complain and I meant it. But wouldn’t it be a delight to God if I instead rejoiced? If I could bend down in the midst of my barren field or broken heart and find a treasure? 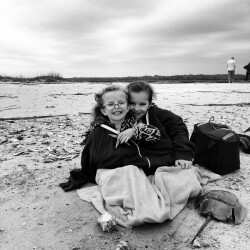 I went back to Edisto a few weeks ago, meeting my son, his wife and now two daughters there. The weather was cold and rainy but we decided to embrace it. I was just happy it wasn’t snow. 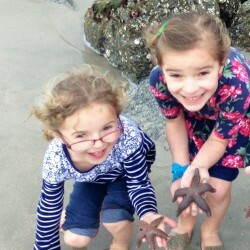 Brooklynn and Olive are six and four now. It didn’t matter at all to them that it was rainy and cold, They still chased the waves, found a family of starfish (I never thought of starfish as adorable before), and sang songs to Jesus from our condo balcony in the rain. Jesus – the Author and the Finisher of our faith. The only one who sees the horizon, who needs to. Our part is to just stay steadfast, to move forward, sowing precious seed. When they bury a child in Africa, they engrave a sunrise for birth and a sunset for death. I like that. Someday, the sun will ease down over our field and our work here will be done. Some fields are longer and harder than others but we will be perfect and complete, lacking nothing. That’s the gold medal. And before I toss it at Jesus’ feet, I will thank Him for every trial he gave me. Help me Lord, to rejoice now, for the joy before me and for the treasure along the way.